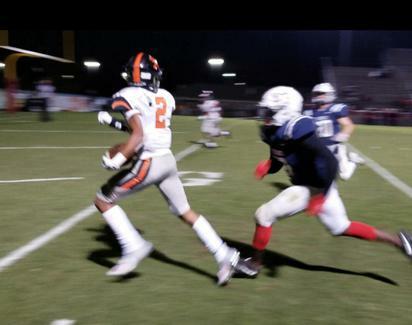 MADISON, Alabama -- The #8 Austin Black Bears pulled away in the fourth quarter to go on to defeat Bob Jones in a Class7A, Region 4 contest at Madison City Stadium Thursday night. Bob Jones cut the Austin lead to eight points early in the fourth quarter but Austin came right back on their possession to get another touchdown to put the game away in the fourth quarter. With the win, Austin goes to 6-0 in the region and will play James Clemens next week for the region title. "We have a big one next week," said Black Bears head coach Jeremy Perkins. "Next week is the region championship. We need to have a good week of practice and a good week of preparation. With the short week, we didn't really didn't get a lot done this week. Sometimes its good to have a short week to keep them healthy and rested." Austin (7-1, 6-0) started the game fast and furious as they scored on their first three possessions. After Bob Jones gave up on a 3-and-out to start the game, Austin scored on their first possession of the game on a Tybo Williams 64-yard touchdown run and the Black Bears led 7-0 with 8:58 left in the first quarter. After another defensive stand by Austin, the Black Bears scored again with 4:27 left in the first quarter, when Kulyn Hubbard hit Jayden Grissom on a short pass and he turned it into a 65-yard touchdown pass play. With the score, Austin led 13-0 after the extra point was missed. With 11:52 left in the second quarter, Reddy Steward scored on a 2-yard touchdown run and Austin led 20-0 and looked like they were going to cruise going away. "I was very pleased how we started out the game," added Perkins. "We had great energy to start the game, but we didn't finish the game like we needed to do. We had three turnovers and was kind of the downside of it but did what we did to get the win. I was proud to see how we responded when the game was close in the fourth quarter that we had two great drives to close out the game." Early in the second quarter, Austin was driving again but quarterback & safety Caden Rose picked off an Austin pass in the end zone and turned away a Black Bears scoring opportunities with 9:58 left in the half. The Patriots have four players with injuries that are out for the season and have forced offensive players to play both ways on defense and Rose is one of those players. Bob Jones drove the ball after the interception and Rose hit his favorite target John Michael Riley for a 7-yard touchdown pass to put the Patriots on the scoreboard. Austin came right back after a good kick return and a few plays later Hubbard found Tre' Shackelford wide open down the field and he walked into the end zone. With :42 seconds left in the half, Austin led 27-7 to go into halftime. Early in the third quarter, Bob Jones (5-4, 2-4) and Rose picked off his second Austin pass of the game and then turned it into a Patriots touchdown when he scored on a 5-yard touchdown run. "I think Caden is a winner," added Perkins. "He is a heck of an athlete. You can see they way be plays, he is a winner. He is one of the best players in our area." WIth 7:06 left in the third quarter, Bob Jones cut the lead to 27-14. With 1:32 left in the third quarter, Hector Godinez kicks a 21-yard field goal and the Black Bears led 30-14, but Bob Jones wasn't done scoring. WIth 9:49 left in the fourth quarter, Khalil Griffin scored on a 2-yard touchdown run and Rose found Cameron Pugh on the two-point conversion and Bob Jones cut the score to 30-22 early in the fourth quarter. Austin put the game away with 7:42 left in the game on a Steward 16-yard touchdown run as he was hit twice coming around the left end but still found his way into the end zone and Austin led 37-22. "I just had to keep running to put the game away," said Black Bears DB/RB. "I really didn't think about scoring when I was hit the first time, but after breaking the second tackle I thought that I was going to score. We need to stay focus because we have the most important region game coming up and we need to have a great week of practices, but this was a good win for us tonight." For Austin, Grissom caught had three receptions for 116 yards, including a 65-yard touchdown early in the first quarter. For Bob Jones, Rose was 8-for-16 passing for 53 yards with 40 yards on 9 carries and a touchdown along with two interceptions on defense. "I think Caden is a fierce competitor that plays with great passion," said Patriots head coach Kevin Rose. "We want all our kids to play with great compassion and intensity. We just have to get everyone on the same page. We have sometimes three or four guys on offense that has to play defense, but we have a chance to still get into the playoffs next week." Up next for Bob Jones is hosting Huntsville while Austin will play James Clemens at the Madison City School Stadium for the region title.